Greater Manchester is governed by the Greater Manchester Combined Authority (GMCA), which consists of political leaders from each of the ten metropolitan borough councils, plus a directly elected mayor, with responsibility for economic development, regeneration and transport. 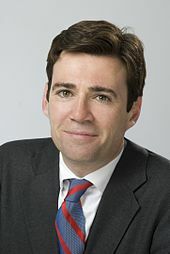 Andy Burnham is the inaugural Mayor of Greater Manchester, elected in 2017. For the 12 years following 1974 the county had a two-tier system of local government; district councils shared power with the Greater Manchester County Council. The county council was abolished in 1986, and so its districts (the metropolitan boroughs) effectively became unitary authority areas. However, the metropolitan county continued to exist in law and as a geographic frame of reference, and as a ceremonial county, with a Lord Lieutenant and a High Sheriff. Several county-wide services were co-ordinated through the Association of Greater Manchester Authorities between 1985 and 2011. Before the creation of the metropolitan county, the name SELNEC was used for the area, from the initials of "South East Lancashire North East Cheshire". 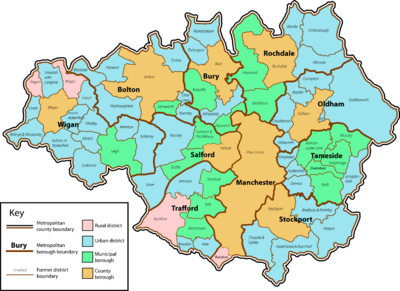 Greater Manchester is an amalgamation of 70 former local government districts from the former administrative counties of Lancashire, Cheshire, the West Riding of Yorkshire and eight independent county boroughs. Since deindustrialisation in the mid-20th century, Greater Manchester has emerged as an exporter of media and digital content, guitar and dance music, and association football. The Local Government Act 1972 reformed local government in England by creating a system of two-tier metropolitan and non-metropolitan counties and districts throughout the country. The act formally established Greater Manchester on 1 April 1974, although Greater Manchester County Council (GMCC) had been running since elections in 1973. The leading article in The Times on the day the Local Government Act came into effect noted that the "new arrangement is a compromise which seeks to reconcile familiar geography which commands a certain amount of affection and loyalty, with the scale of operations on which modern planning methods can work effectively". Frangopulo noted that the creation of Greater Manchester "was the official unifying of a region which, through history and tradition, had forged for itself over many centuries bonds ... between the communities of town and village, each of which was the embodiment of the character of this region". The name Greater Manchester was adopted, having been favoured over Selnec by the local population. Unlike the other counties created by the Act, Greater Manchester was never adopted as a postal county by the Royal Mail. A review in 1973 noted that "Greater Manchester" would be unlikely to be adopted because of confusion with the Manchester post town. The component areas of Greater Manchester therefore retained their pre-1974 postal counties until 1996, when the counties were abolished. 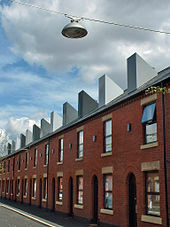 Following a bid from AGMA highlighting the potential benefits in combatting the late-2000s financial crisis, it was announced in the 2009 United Kingdom Budget that Greater Manchester and the Leeds City Region would be awarded Statutory City Region Pilot status, allowing (if they desired) for their constituent district councils to pool resources and become statutory Combined Authorities with powers comparable to the Greater London Authority. The stated aim of the pilot was to evaluate the contributions to economic growth and sustainable development by Combined Authorities. The Local Democracy, Economic Development and Construction Act 2009 enabled the creation of a Combined Authority for Greater Manchester with devolved powers on public transport, skills, housing, regeneration, waste management, carbon neutrality and planning permission, pending approval from the ten councils. Such strategic matters would be decided on via an enhanced majority rule voting system involving ten members appointed from among the councillors of the metropolitan boroughs (one representing each borough with each council nominating one substitute) without the input of central government. The ten district councils of Greater Manchester approved the creation of the Greater Manchester Combined Authority (GMCA) on 29 March 2010, and submitted final recommendations for a constitution to the Department for Communities and Local Government and the Department for Transport. On 31 March 2010 the Communities Secretary John Denham approved the constitution and launched a 15-week public consultation on the draft bill together with the approved constitution. Following requests by the Association of Greater Manchester Authorities, which was superseded by the GMCA, the new authority came into being on 1 April 2011. On the same day, the Transport for Greater Manchester Committee was also formed from a pool of 33 councillors allocated by council population (roughly one councillor per 75,000 residents) to scrutinise the running of Greater Manchester's transport bodies and their finances, approve the decisions and policies of said bodies and form strategic policy recommendations or projects for the approval of the Combined Authority. On 3 November 2014, George Osborne, the Chancellor of the Exchequer, announced that there would be an eleventh member of the GMCA — a directly elected Mayor of Greater Manchester, with "powers over transport, housing, planning and policing" from 2017. 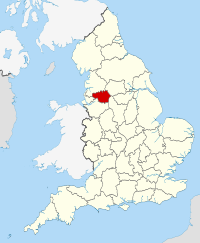 Greater Manchester is a landlocked county spanning 493 square miles (1,277 km2). The Pennines rise to the north and east of the county with the West Pennine Moors in the northwest, the South Pennines in the northeast and the Peak District in the east. Several coalfields (mainly sandstones and shales) lie in the west of the county while the Cheshire Plain fringes the south. The rivers Mersey, Irwell and Tame run through Greater Manchester, all of which rise in the Pennines. Other rivers traverse the region as tributaries to the major rivers, including the Douglas, the Irk, and the Roch. Black Chew Head is the highest point in Greater Manchester which forms part of the Peak District National Park, rising 1,778 feet (542 m) above sea-level, within the parish of Saddleworth. Greater Manchester experiences a temperate maritime climate, like most of the British Isles, with relatively cool summers and mild winters. The county's average annual rainfall is 806.6 millimetres (31.76 in) compared to the UK average of 1,125.0 millimetres (44.29 in), and its mean rain days are 140.4 mm (5.53 in) per annum, compared to the UK average of 154.4 mm (6.08 in). The mean temperature is slightly above average for the United Kingdom. Greater Manchester has a relatively high humidity level, which lent itself to the optimised and breakage-free textile manufacturing process that took place around the county. Snowfall is not common in the built up areas because of the urban warming effect but the West Pennine Moors in the northwest, South Pennines in the northeast and Peak District in the east receive more snow, and roads leading out of the county can be closed due to heavy snowfall. They include the A62 road via Standedge, the Pennine section of the M62 and the A57, Snake Pass, towards Sheffield. At the most southern point of Greater Manchester, Woodford's Met Office weather station recorded a temperature of −17.6 °C (0.3 °F) on 8 January 2010. Contrary to its reputation for urban sprawl, Greater Manchester has green belt constraining urban drift, and a "wide and varied range" of wildlife and natural habitats. For instance, the wooded valleys of Bolton, Bury and Stockport, the moorlands north and east of Rochdale, Oldham and Stalybridge, and the reed beds between Wigan and Leigh, harbour flora and fauna of national importance. Mature woodland, scrubland, grassland, high moorland, mossland, agricultural land, lakes, wetlands, river valleys, embankments, urban parks and suburban gardens are habitats found in Greater Manchester which further contribute to biodiversity. The Greater Manchester Ecology Unit classifies Sites of Biological Importance. The Greater Manchester Combined Authority (GMCA) is the top-tier administrative body for the local governance of Greater Manchester. It was established on 1 April 2011 as a pilot combined authority, unique to local government in the United Kingdom. Upon formation, it consisted of ten indirectly elected members, each a directly elected councillor from one of the ten metropolitan boroughs that comprise Greater Manchester. The authority derives most of its powers from the Local Government Act 2000 and Local Democracy, Economic Development and Construction Act 2009, and replaced a range of single-purpose joint boards and quangos in 2011, to provide a formal administrative authority for Greater Manchester with powers over public transport, skills, housing, regeneration, waste management, carbon neutrality and planning permission. Functional executive bodies, such as Transport for Greater Manchester, are responsible for delivery of services in these areas. On 3 November 2014, the Devolution to the Greater Manchester Combined Authority agreement was signed to pass further powers and responsibilities, as well as the establishment of an elected Mayor of Greater Manchester. From April 2016, Greater Manchester became the first area of England to "get full control of its health spending" with a devolution deal which unites the region's health and social care systems under one budget under the control of local leaders, including Greater Manchester's new directly elected mayor. On 4 May 2017, Labour politician Andy Burnham was elected as the inaugural mayor, joining the GMCA as its eleventh member and serving as its leader. Beneath the GMCA are the ten councils of Greater Manchester's ten districts, which are Bolton, Bury, the City of Manchester, Oldham, Rochdale, the City of Salford, Stockport, Tameside, Trafford and Wigan. These district councils have the greatest powers over public services, and control matters such as council tax, education provision, social housing, libraries and healthcare. Eight of the ten metropolitan boroughs were named after the eight former county boroughs that now compose the largest centres of population and greater historical and political prominence. As an example, the Metropolitan Borough of Stockport is centred on the town of Stockport, a former county borough, but includes other smaller settlements, such as Cheadle, Gatley, and Bramhall. The names of two of the metropolitan boroughs were given a neutral name because, at the time they were created, there was no agreement on the town to be put forward as the administrative centre and neither had a county borough. These boroughs are Tameside and Trafford, centred on Ashton-under-Lyne and Stretford, respectively, and are named with reference to geographical and historical origins. The lowest formal tier of local government in Greater Manchester are the parish councils, which cover the various civil parishes in Greater Manchester, and have limited powers over upkeep, maintenance and small grants. Although used as a "successful brand", Greater Manchester's politics have been characterised by "entrenched localism and related rivalries", historically resistant to regionalism. The major towns in Greater Manchester retain a "fierce independence", meaning Greater Manchester is administered using "inter-municipal coordination" on a broadly voluntary basis. That eight of the ten borough councils have (for the most part) been Labour-controlled since 1986, has helped maintain this informal co-operation between the districts at a county-level. After the abolition of the county council, the ten authorities of Greater Manchester co-operated voluntarily on policy issues like Local Transport Plans as well as funding the Greater Manchester County Record Office, and local services were administered by statutory joint boards. Now under the direction of the Greater Manchester Combined Authority, these joint boards are Transport for Greater Manchester (TfGM) which is responsible for planning and co-ordinating public transport across the county; the Greater Manchester Fire and Rescue Service, who are administered by a joint Fire and Rescue Authority; and the Greater Manchester Waste Disposal Authority. These joint boards are made up of councillors appointed from each of the ten boroughs (except the Waste Disposal Authority, which does not include the Metropolitan Borough of Wigan). Greater Manchester Police was formerly overseen by a joint police authority, but is now overseen by the Greater Manchester Police and Crime Commissioner owing to reforms introduced in 2012. The ten borough councils are joint-owners of the Manchester Airport Group which controls Manchester Airport and three other UK airports. Other services are directly funded and managed by the local councils. Greater Manchester is a ceremonial county with its own Lord-Lieutenant who is the personal representative of the monarch. The Local Government Act 1972 provided that the whole of the area to be covered by the new metropolitan county of Greater Manchester would also be included in the Duchy of Lancaster – extending the duchy to include areas which were formerly in the counties of Cheshire and the West Riding of Yorkshire. Until 31 March 2005, Greater Manchester's Keeper of the Rolls was appointed by the Chancellor of the Duchy of Lancaster; they are now appointed by the Lord High Chancellor of Great Britain. The first Lord Lieutenant of Greater Manchester was Sir William Downward who held the title from 1974 to 1988. The current Lord Lieutenant is Warren James Smith. As a geographic county, Greater Manchester is used by the government (via the Office for National Statistics) for the gathering of county-wide statistics, and organising and collating general register and census material. In terms of representation in the Parliament of the United Kingdom, Greater Manchester is divided into 28 parliamentary constituencies – 18 borough constituencies and 10 county constituencies. 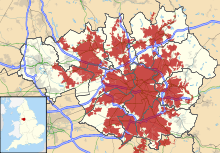 Most of Greater Manchester is controlled by the Labour party, and is generally considered a Labour stronghold. At the 2015 UK General Election in Greater Manchester, Labour won 22 seats and the Conservatives won 5. Greater Manchester has a population of 2,798,800 (mid-2017 estimate), making it the third most populous county in England after Greater London and the West Midlands and the highest ever for the county. The demonym of Greater Manchester is "Greater Mancunian". The Manchester accent and dialect, native to Manchester, is common in the city and adjacent areas, but gives way to "slower, deeper accents" towards Greater Manchester's fringes and suburbs. Greater Manchester is home to a diverse population and is a multicultural agglomeration with an ethnic minority population comprising 8.5% of the total population in 2001. In 2008, there were over 66 refugee nationalities in the county. At the 2001 UK census, 74.2% of Greater Manchester's residents were Christian, 5.0% Muslim, 0.9% Jewish, 0.7% Hindu, 0.2% Buddhist, and 0.1% Sikh. 11.4% had no religion, 0.2% had an alternative religion and 7.4% did not state their religion. This is similar to the rest of the country, although the proportions of Muslims and Jews are nearly twice the national average. It contains the Heaton Park Hebrew Congregation, a large Ashkenazi Orthodox synagogue in North Manchester. Greater Manchester is covered by the Roman Catholic Dioceses of Salford and Shrewsbury, and the Archdiocese of Liverpool. Most of Greater Manchester is part of the Anglican Diocese of Manchester, apart from Wigan which lies within the Diocese of Liverpool. Greater Manchester has five universities: the Manchester Metropolitan University, the University of Bolton, the University of Law, the University of Manchester and the University of Salford. Together with the Royal Northern College of Music they had a combined population of students of 101,165 in 2007 – the third highest number in England behind Greater London (360,890) and the West Midlands (140,980), and the thirteenth highest in England per head of population. The majority of students are concentrated on Oxford Road in Manchester, Europe's largest urban higher education precinct. As of 2010, further education in Greater Manchester is co-ordinated by the Greater Manchester Colleges Group, a joint venture composed of an association of 24 colleges in the region. Primary and secondary education within Greater Manchester are the responsibility of the constituent boroughs which form local education authorities and administer schools. The county has several independent schools such as Bolton School, Bury Grammar School, Manchester Grammar School, Oldham Hulme Grammar School, St Bede's College , Stockport Grammar School and Chethams School of Music. Much of Greater Manchester's wealth was generated during the Industrial Revolution, particularly textile manufacture. The world's first cotton mill was built in the town of Royton, and the county encompasses several former mill towns. 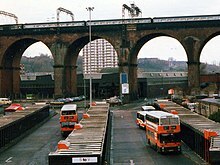 An Association for Industrial Archaeology publication describes Greater Manchester as "one of the classic areas of industrial and urban growth in Britain, the result of a combination of forces that came together in the 18th and 19th centuries: a phenomenal rise in population, the appearance of the specialist industrial town, a transport revolution, and weak local lordship". Much of the county was at the forefront of textile manufacture during the Industrial Revolution and into the early-20th century; Peter Smith, Baron Smith of Leigh, chair of the Greater Manchester Combined Authority said "clearly, all of the Greater Manchester area was once at the heart of a very vibrant [textiles] industry", represented by former textile mills found throughout the county. 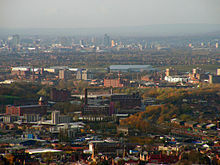 The territory that makes up Greater Manchester experienced a rapid decline of these traditional sectors, partly during the Lancashire Cotton famine brought on by the American Civil War, but mainly as part of the post-war economic depression and deindustrialization of Britain that occurred during the 20th century. Considerable industrial restructuring has helped the region to recover from deindustrialisation and the demise of the mass production of textiles. Historically, the docks at Salford Quays were an industrial port, though are now (following a period of disuse) a commercial and residential area which includes the Imperial War Museum North and The Lowry theatre and exhibition centre. The BBC is now established in their new home at MediaCityUK, at Salford Quays. This is home to BBC North West, several BBC departments, including BBC Sport, Blue Peter and, since April 2012, BBC Breakfast. Rochdale and Manchester are connected to the history of the cooperative movement; the Rochdale Society of Equitable Pioneers (an early consumer co-operative) was founded in Rochdale in 1844, and The Co-operative Group, the UK's largest mutual business and North West England's biggest company, is headquartered at One Angel Square in central Manchester. Despite this economic diversification, as of November 2012, government plans are under development to revive textile production in Greater Manchester, and restore it as the national home of British textile manufacture. Today, Greater Manchester is the economic centre of the North West region of England and is the largest sub-regional economy in the UK outside London and South East England. Greater Manchester represents more than £42 billion of the UK regional GVA, more than Wales, Northern Ireland or North East England. Manchester city centre, the central business district of Greater Manchester, is a major centre of trade and commerce and provides Greater Manchester with a global identity, specialist activities and employment opportunities; similarly, the economy of the city centre is dependent upon the rest of the county for its population as an employment pool, skilled workforce and for its collective purchasing power. Manchester today is a centre of the arts, the media, higher education and commerce. In a poll of British business leaders published in 2006, Manchester was regarded as the best place in the UK to locate a business. A report commissioned by Manchester Partnership, published in 2007, showed Manchester to be the "fastest-growing city" economically. It is the third most visited city in the United Kingdom by foreign visitors and is now often considered to be the second city of the UK. The Trafford Centre is one of the largest shopping centres in the United Kingdom, and is located within the Metropolitan Borough of Trafford. At the 2001 UK census, there were 1,805,315 residents of Greater Manchester aged 16 to 74. The economic activity of these people was 40.3% in full-time employment, 11.3% in part-time employment, 6.7% self-employed, 3.5% unemployed, 5.1% students without jobs, 2.6% students with jobs, 13.0% retired, 6.1% looking after home or family, 7.8% permanently sick or disabled and 3.5% economically inactive for other reasons. The figures follow the national trend, although the percentage of self-employed people is below the national average of 8.3%. The proportion of unemployment in the county varies, with the Metropolitan Borough of Stockport having the lowest at 2.0% and Manchester the highest at 7.9%. In 2001, of the 1,093,385 residents of Greater Manchester in employment, the industry of employment was: 18.4% retail and wholesale; 16.7% manufacturing; 11.8% property and business services; 11.6% health and social work; 8.0% education; 7.3% transport and communications; 6.7% construction; 4.9% public administration and defence; 4.7% hotels and restaurants; 4.1% finance; 0.8% electricity, gas, and water supply; 0.5% agriculture; and 4.5% other. This was roughly in line with national figures, except for the proportion of jobs in agriculture which is only about a third of the national average of 1.5%, due to the overwhelmingly urban, built-up land use of Greater Manchester. Manchester hosted the 2002 Commonwealth Games which was, at a cost of £200M for the sporting facilities and a further £470M for local infrastructure, by far the biggest and most expensive sporting event held in the UK and the first to be an integral part of urban regeneration. A mix of new and existing facilities were used. New amenities included the Manchester Aquatics Centre, Bolton Arena, the National Squash Centre, and the City of Manchester Stadium. The Manchester Velodrome was built as part of the Manchester bid for the 2000 Summer Olympics. After the Commonwealth Games the City of Manchester Stadium was converted for football use, and the adjacent warm-up track upgraded to become the Manchester Regional Arena. Other facilities continue to be used by elite athletes. Cambridge Policy Consultants estimate 4,500 full-time jobs as a direct consequence, and Grattan points to other long-term benefits accruing from publicity and the improvement of the area's image. Association football is "woven into the cultural fabric of Greater Manchester", by way of its numerous football clubs – two of which play in the Premier League - which draw support, visitors and economic benefits to Greater Manchester valued at £330 million per year as of 2013. The Manchester Football Association is the sport's governing body in Greater Manchester, and is committed to its promotion and development. Manchester United F.C. are one of the world's best-known football teams, and in 2008 and 2017 Forbes estimated that they were the world's richest club. They have won the League Championship a record twenty times (most recently in 2012-2013), the FA Cup twelve times, the Football League Cup five times and have been European Champions three times. Their Old Trafford ground has hosted the FA Cup Final England international matches and the 2003 UEFA Champions League Final between Juventus and A.C. Milan. Manchester City F.C. moved from Maine Road to the City of Manchester Stadium after the 2002 Commonwealth Games. They have won the league championship five times (most recently in 2017-18), the FA Cup five times and the Football League Cup five times. In addition, Wigan Athletic F.C. are one of the county's younger sides, and won their first major trophy in 2013, defeating Manchester City F.C. in the FA Cup final. They currently play in the Championship. Other professional clubs in the area include Bolton Wanderers F.C., Oldham Athletic A.F.C., Bury F.C. and Rochdale A.F.C., all playing in League One, as well as Salford City F.C. in the National League. Manchester also has clubs in the National League North including Stockport County F.C. and F.C United of Manchester. In rugby league, Wigan Warriors, Salford Red Devils and Leigh Centurions compete in the Super League, the top-level professional rugby league football club competition in Europe. Wigan have won the Super League/Rugby Football League Championship twenty–one times, the Challenge Cup nineteen times, and the World Club Challenge three times. Swinton Lions, Oldham R.L.F.C. and Rochdale Hornets play in the second tier Championship. There is also a large network of junior/community rugby league clubs across the metropolitan area which act as feeder teams to the elite sides, the most notable being Manchester Rangers. In rugby union, Stockport's Sale Sharks compete in the Guinness Premiership, and won the league in 2006. Whitefield based Sedgley Park RUFC compete in National Division One, Manchester RUFC in National Division Two and Wigan side Orrell R.U.F.C. in National Division Three North. Lancashire County Cricket Club began as Manchester Cricket Club and represents the (ancient) county of Lancashire. Lancashire contested the original 1890 County Championship. The team has won the County Championship nine times, most recently in 2011. Their Old Trafford ground, near the football stadium of the same name, regularly hosts test matches. Possibly the most famous took place in 1956, when Jim Laker took a record nineteen wickets in the fourth test against Australia. Cheshire County Cricket Club are a minor counties club who sometimes play in the south of the county. The Kirkmanshulme Lane stadium in Belle Vue is the home to top-flight speedway team the Belle Vue Aces and regular greyhound racing. Professional ice hockey returned to the area in early 2007 with the opening of a purpose-designed rink in Altrincham, the Altrincham Ice Dome, to host the Manchester Phoenix. Their predecessor, Manchester Storm, went out of business in 2002 because of financial problems that led to them being unable to pay players' wages or the rent for the Manchester Arena in which they played. Horse racing has taken place at several sites in the county. The two biggest courses were both known as Manchester Racecourse – though neither was within the boundaries of Manchester – and ran from the 17th century until 1963. Racing was at Kersal Moor until 1847 when the racecourse at Castle Irwell was opened. In 1867 racing was moved to New Barnes, Weaste, until the site was vacated (for a hefty price) in 1901 to allow an expansion to Manchester Docks. The land is now home to Dock 9 of the re-branded Salford Quays. Racing then moved back to Castle Irwell which later staged a Classic – the 1941 St. Leger – and was home to the Lancashire Oaks (nowadays run at Haydock Park) and the November Handicap, which was traditionally the last major race of the flat season. Through the late 50s and early 60s the track saw Scobie Breasley and Lester Piggott annually battle out the closing acts of the jockey's title until racing ceased on 7 November 1963. The Greater Manchester Community Basketball Club is an association which represents Greater Manchester in basketball. It supports a variety of teams, including Manchester Magic. The Greater Manchester County Crown Green Bowling Association appoints Junior, Senior and Veteran teams to represent Greater Manchester in the sport of bowls. Founded by Greater Manchester's ten district councils in 1996, GreaterSport is the County Sports Partnership for Greater Manchester which works closely with the sports and physical activity sectors and coordinates events such as the Greater Manchester Youth Games. The Greater Manchester Sports Fund aims to ensure that people in Greater Manchester aged 12–21 competing in any kind of sport, irrespective of background, are able to obtain grants of up to £750 so that they can better fulfil their potential. There are several delicacies native to Greater Manchester. Savoury dishes include black pudding, a blood sausage typically associated with Bury and Bury Market; pasty barm, a combined pasty-barm cake created in Bolton; and rag pudding, a suet pastry pudding from Oldham filled with steak and onion and steamed in a cloth or wrapper to cook; the Manchester egg was introduced in 2010. Sweet dishes include Eccles cake — native to Eccles — a small round flaky pastry cake filled with currants, sugar and spice; Manchester tart, a baked tart which consists of a shortcrust pastry shell spread with raspberry jam, covered with a custard filling and topped with flakes of coconut; and Uncle Joe's Mint Balls, traditional sweet mild mints manufactured in Wigan since their inception in 1898. Vimto and Tizer are soft drinks invented in Manchester in 1908 and 1924 respectively. Boddingtons is a bitter developed in Manchester and promoted as the "Cream of Manchester" in a popular 1990s advertising campaign credited with raising the city's profile. Greater Manchester's museums showcase the county's industrial and social heritage. The Hat Works in Stockport is the UK's only museum dedicated to the hatting industry; the museum moved in 2000 to a Grade II listed Victorian mill, previously a hat factory. The Museum of Science and Industry in Manchester, amongst other displays, charts the rise of science and industry and especially the part Manchester played in its development; the Museums, Libraries and Archives Council described the displays as "pre-eminent collections of national and international importance". Urbis began its life as a museum of the modern city, which attempted to explain the effects and experiences of life in the city. It was then transformed into an exhibition centre, which had its most successful year in 2006. Urbis entered its third phase since opening in 2012 as the National Football Museum. Stockport Air Raid Shelters uses a mile of underground tunnels, built to accommodate 6,500 people, to illustrate life in the Second World War's air raid shelters. 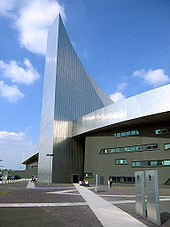 The Imperial War Museum North in Trafford Park is one of the Imperial War Museum's five branches. Alongside exhibitions of war machinery are displays describing how people's lives are affected by war. The Museum of Transport in Manchester, which opened in 1979, has one of the largest collections of vehicles in the country. The People's History Museum is "the national centre for the collection, conservation, interpretation and study of material relating to the history of working people in Britain". The Pankhurst Museum is based in the early feminist Emmeline Pankhurst's former home and includes a parlour laid out in contemporary style. Manchester United, Manchester City, and Lancashire CCC all have dedicated museums illustrating their histories. Wigan Pier, best known from George Orwell's book The Road to Wigan Pier, was the name of a wharf on the Leeds and Liverpool Canal in Wigan. The name has been reused to describe an industrial-based visitor attraction, partly closed for redevelopment as of 2008. ^ "Beaverbrooks' Chairman appointed High Sheriff of Greater Manchester". BusinessManchester. Retrieved 16 April 2019. ^ a b "Population estimates for UK, England and Wales, Scotland and Northern Ireland". www.ons.gov.uk. Office for National Statistics. 28 June 2018. Retrieved 16 July 2018. ^ a b "UK Standard Area Measurements (SAM)". Office for National Statistics. Retrieved 28 September 2012. ^ a b Office for National Statistics. "Gazetteer of the old and new geographies of the United Kingdom" (PDF). statistics.gov.uk. p. 48. Archived from the original (PDF) on 8 March 2008. Retrieved 2 March 2014. ^ a b c "Greater Manchester Gazetteer". Greater Manchester County Record Office. Places names – G to H. Archived from the original on 18 July 2011. Retrieved 17 June 2008. ^ a b c Straw, Will (5 March 2014). "Greater Manchester is a creative powerhouse". theguardian.com. Retrieved 16 December 2014. ^ Nevell & Redhead 2005, p. 20. ^ Adrian Morris. "Roman Wigan". Wigan Archaeological Society. Retrieved 10 July 2008. ^ Bayliss 1996, p. 6. ^ Historic England. "Mamucium Roman fort (76731)". PastScape. Retrieved 29 December 2007. ^ Historic England. 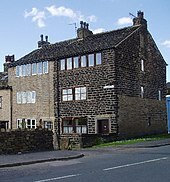 "Castle Shaw (45891)". PastScape. Retrieved 29 December 2007. ^ Frangopulo 1977, p. ix. ^ Frangopulo 1977, pp. 24–25. ^ a b c d McNeil & Nevell 2000, pp. 1–3. ^ a b c d e f g h "55: Manchester Conurbation" (PDF). naturalengland.org.uk. 18 July 2013. Retrieved 5 August 2013. ^ Aspin 1981, p. 3. ^ a b Carter 1962, p. 49. ^ Cowhig 1976, pp. 7–9. ^ Kidd 2006, pp. 12,15–24, 224. ^ a b Hall, Peter (1998). "The first industrial city: Manchester 1760–1830". Cities in Civilization. Weidenfeld & Nicolson. ISBN 0-297-84219-6. ^ a b c d e Schofield 2003, pp. 34–35. ^ a b c Frangopulo 1977, p. 226. ^ Frangopulo 1977, p. 268. ^ Swarbrick, J. (February 1914). Greater Manchester: The Future Municipal Government of Large Cities. Institution of Municipal and County Engineers. pp. 12–15. ^ Frangopulo 1977, p. 229. ^ a b Frangopulo 1977, p. 227. ^ a b c Frangopulo 1977, p. 228. ^ Frangopulo 1977, p. 231. ^ Frangopulo 1977, p. 234. ^ a b c Redcliffe-Maud 1969, pp. 219–235. ^ Frangopulo 1977, p. 233. ^ Frangopulo 1977, p. 264. ^ The SELNEC Preservation Society. "The Formation of the SELNEC PTE". selnec.org.uk. Retrieved 6 July 2008. ^ a b c Redcliffe-Maud & Wood 1975, pp. 46–7, 56, 157. ^ Parliamentary Debates (Hansard). House of Commons. 6 July 1972. col. 763–834. ^ "Lancashire saved from 'Botchdale'". The Times. 7 July 1972. p. 8. ^ "Philosophy on councils has yet to emerge". The Times. 8 July 1972. p. 2. ^ At 31 March 1974, Ringway was a civil parish in the Bucklow Rural District. ^ Office of the Deputy Prime Minister. "Local Government Finance Statistics England No.16". local.odpm.gov.uk. Archived from the original on 7 August 2011. Retrieved 2 March 2014. ^ "British Local Election Database, 1889–2003". Arts and Humanities data service. 28 June 2006. Retrieved 5 March 2008. ^ "All change in local affairs". The Times. 1 April 1974. p. 15. ^ Frangopulo 1977, p. xii. ^ Frangopulo 1977, p. 246. ^ Bristow & Cross 1983, p. 30. ^ Frangopulo 1977, pp. 246, 255. ^ a b c Wannop 2002, pp. 144–145. ^ Parkinson-Bailey 2000, pp. 214–5. ^ Taylor, Evans & Fraser 1996, p. 76. ^ a b c d Clapson 2010, pp. 123–124. ^ "Changes in local government units may cause some famous names to disappear". The Times. 2 January 1973. p. 2. ^ Address Management Guide. Royal Mail. 2004. ^ a b Wilson & Game 2002, p. 61. ^ Walker, David (15 January 1983). "Tory plan to abolish GLC and metropolitan councils, but rates stay". The Times. p. 2. ^ "Angry reaction to councils White Paper". The Times. 8 October 1983. p. 22. ^ Wilson & Game 2002, p. 62. ^ Association of Greater Manchester Authorities. "About AGMA". agma.gov.uk. Archived from the original on 15 September 2008. Retrieved 5 March 2008. ^ BISER Europe Regions Domain Reporting (2003). "Regional Portrait of Greater Manchester – 5.1 Spatial Structure" (PDF). biser-eu.com. Archived from the original (PDF) on 18 October 2006. Retrieved 2 March 2014. ^ HMSO. Lieutenancies Act 1997 Archived 19 May 2011 at WebCite. 1997 c.23. ^ Wood, Edward (11 December 1998). Research Paper 98/115 –The Greater London Authority Bill: A Mayor and Assembly for London – Bill 7 of 1998–99 (PDF). House of Commons Library. Archived from the original (PDF) on 20 November 2006. ^ HM Treasury (17 July 2007). "Sub-national economic development and regeneration review". hm-treasury.gov.uk. Archived from the original on 15 December 2007. Retrieved 2 March 2014. ^ Fairley, Peter (18 January 2008). "Comment – A faster track for the city-regions". publicfinance.co.uk. Archived from the original on 5 January 2009. Retrieved 29 September 2012. ^ Ottewell, David (25 June 2008). "Now YOU can vote on congestion charge". Manchester Evening News. pp. 1–2. ^ "More than the sum of their parts – partnerships seal deal to increase economic growth". communities.gov.uk. 14 July 2008. Archived from the original on 3 August 2008. Retrieved 16 July 2008. ^ "Date set for C-charge referendum". news.bbc.co.uk. 29 September 2008. Retrieved 5 January 2010. ^ Sturcke, James (12 December 2008). "Manchester says no to congestion charging". guardian.co.uk. Retrieved 12 December 2008. ^ a b c Association of Greater Manchester Authorities (2009). "City Region Governance: A consultation on future arrangements in Greater Manchester" (PDF). agma.gov.uk. Archived from the original (PDF) on 19 March 2010. Retrieved 18 March 2010. ^ Association of Greater Manchester Authorities. "City Region". agma.gov.uk. Archived from the original on 14 March 2010. Retrieved 18 March 2010. ^ HM Treasury (16 December 2009). "Greater Manchester granted city region status". hm-treasury.gov.uk. Archived from the original on 21 December 2009. Retrieved 2 March 2014. ^ "John Denham – Greater Manchester to be country's first ever Combined Authority". communities.gov.uk. 31 March 2010. Archived from the original on 4 May 2010. Retrieved 18 October 2010. ^ "Plan to end rail and road misery". thisislancashire.co.uk. 31 March 2010. Retrieved 31 March 2010. ^ "Greater Manchester to become first 'city region'". Oldham Advertiser. oldhamadvertiser.co.uk. 29 March 2010. Archived from the original on 5 September 2012. Retrieved 30 March 2010. ^ "Greater Manchester agrees to combined authority". Manchester City Council. 29 March 2010. Retrieved 31 March 2010. ^ "Safeguard to prevent C-charge is welcomed". theboltonnews.co.uk. 9 December 2010. Retrieved 14 December 2010. ^ HM Treasury and The Rt Hon George Osborne MP (3 November 2014). "Manchester to get directly elected Mayor". gov.uk. Retrieved 5 December 2014. ^ Dawson 1992, "Chapter 6: The County Tops". ^ a b c d Greater Manchester Passenger Transport Authority. "The Greater Manchester Area and its Regional Context". gmltp.co.uk. Archived from the original on 27 September 2007. Retrieved 2 March 2014. ^ a b Manchester City Council (11 July 2012). "Manchester's Local Development Framework: Core Strategy Development Plan Document" (PDF). manchester.gov.uk. Retrieved 16 June 2013. Part of the City Centre is in Salford and both the Regional Centre and Inner Areas cover areas of Manchester, Salford and Trafford... Manchester City Centre is defined as the area inside the Inner Relief Route and extends to the south to encompass the Oxford Road Corridor. The City Centre also extends to Chapel Street, within the administrative boundary of Salford City Council. ^ Ravetz 2000, p. 50. ^ a b Association of Greater Manchester Authorities (August 2009). "Prosperity for all: The Greater Manchester Strategy" (PDF). agma.gov.uk. Archived from the original (PDF) on 20 January 2014. Retrieved 22 June 2013. ^ a b "Greater Manchester councils plan "unique" town centre investment strategy". localgovernmentexecutive.co.uk. 19 March 2013. Archived from the original on 21 October 2013. Retrieved 22 June 2013. 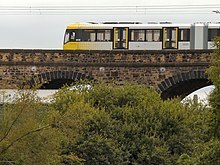 ^ TfGM; GMCA (2011). Greater Manchester's third Local Transport Plan 2011/12 – 2015/16 (PDF). Transport for Greater Manchester. Archived from the original (PDF) on 3 March 2016. ^ Kellie 2010, pp. 4-5, 243. ^ Freeman & Snodgrass 1959, p. 155. ^ a b c "2011 Census - Built-up areas". ONS. Retrieved 1 July 2013. ^ "State of the English Cities: Volume 1". Office of the Deputy Prime Minister. 2006. Retrieved 17 December 2006. ^ From Territorial Cohesion to the New Regionalized Europe. Retrieved 5 October 2014. ^ Groom, Brian. "A great northern conurbation". 20 June 2014. Financial Times London UK. Retrieved 19 March 2015. ^ a b "Manchester Airport 1971–2000 weather averages". Met Office. 2001. Archived from the original on 29 September 2007. Retrieved 15 July 2007. ^ a b "UK 1971–2000 averages". Met Office. 2001. Archived from the original on 5 July 2009. Retrieved 15 July 2007. ^ "Annual UK weather averages". Met Office. 2007. Archived from the original on 5 July 2009. Retrieved 23 April 2007. ^ "Roads chaos as snow sweeps in Manchester". Manchester Evening News. 2005. Archived from the original on 30 September 2007. Retrieved on 15 July 2007. ^ "Snow: West Yorkshire traffic and travel latest". Halifax Courier. Halifax Courier. Retrieved 7 January 2017. ^ "Live: M62 motorway closed and 20 miles of queues as snow and high winds return to Greater Manchester". Manchester Evening News. Manchester Evening News. Retrieved 7 January 2018. ^ "Peak District sightseer's guide – Snake Pass". highpeak.co.uk. 2002. Retrieved 6 July 2007. ^ "Icy conditions hit the UK after days of heavy snow". BBC News. news.bbc.co.uk. 7 January 2010. Retrieved 7 January 2010. ^ a b c d e f "Greater Manchester Biodiversity". gmbp.org.uk. Retrieved 7 September 2012. ^ a b c Hardy 1998, p. 7. ^ Manchester City Council. "Sites of Biological Importance". wildaboutmanchester.info. Retrieved 7 September 2012. ^ a b Defra (2002). Aitchison, J.W., ed. "The Commonlands of Greater Manchester: A Biological Survey" (PDF). defra.gov.uk. Archived from the original (PDF) on 1 November 2012. Retrieved 7 September 2012. ^ Greater Manchester Local Record Centre. "Welcome to Greater Manchester LRC". gmwildlife.org.uk. Retrieved 7 September 2012. ^ Greater Manchester Bidiversity Project. "What is biodiversity?". gmbp.org.uk. Retrieved 7 September 2012. ^ "Welcome to the Manchester Field Club". webspace.mypostoffice.co.uk. Archived from the original on 25 June 2013. Retrieved 7 September 2012. ^ Salford City Council (2007). "Chat Moss". salford.gov.uk. Archived from the original on 28 September 2008. Retrieved 13 November 2007. ^ "Appendix J River Mersey Case Study Report". The Countryside Agency. Archived from the original (DOC) on 27 September 2007. Retrieved 27 April 2007. ^ "South Pennine Moors". Defra. Retrieved 21 July 2012. ^ Lashley, Brian (20 March 2003). "So what bloom best suits you?". Manchester Evening News. menmedia.co.uk. Retrieved 7 September 2012. ^ Devon Wildlife Trust. 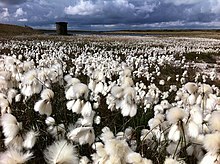 "Species – Cottongrass, common". devonwildlifetrust.org. Archived from the original on 26 June 2015. Retrieved 7 September 2012. ^ Plantlife International. "North-west England". plantlife.org.uk. Archived from the original on 1 May 2013. Retrieved 7 September 2012. ^ Holland, Spence & Sutton 1984, pp. 28–29. ^ a b c d Association of Greater Manchester Authorities (March 2010). "Greater Manchester Combined Authority Final Scheme" (PDF). agma.gov.uk. Archived from the original (PDF) on 23 September 2010. Retrieved 30 March 2010. ^ "Devolution to the Greater Manchester Combined Authority and transition to a directly elected mayor". gov.uk. Retrieved 4 November 2014. ^ "Greater Manchester to control £6bn NHS budget". BBC News. bbc.co.uk. 25 February 2015. Retrieved 26 February 2015. ^ Williams, Jennifer (5 May 2017). "Andy Burnham elected as Greater Manchester's mayor". Manchester Evening News. Retrieved 12 March 2018. ^ "What the Mayor does". greatermanchester-ca.gov.uk. 2018. Retrieved 5 April 2019. ^ a b c Frangopulo 1977, p. 138. ^ Rochdale Metropolitan Borough Council, p. 65. ^ Walker, Jonathan (9 September 2008). "Goodbye West Midlands, hello Greater Birmingham". Birmingham Post. birminghampost.net. Retrieved 24 September 2012. ^ Wannop 2002, p. 148. ^ "Greater Manchester Local Transport Plan". gmltp.co.uk. Archived from the original on 20 July 2011. Retrieved 12 December 2006. ^ "Introducing new police commissioner Tony Lloyd - the most powerful man in Greater Manchester?". Manchester Evening News. menmedia.co.uk. 16 November 2012. Archived from the original on 22 November 2012. Retrieved 2 March 2014. ^ "Manchester Airports Group dividend windfall for councils". BBC News. bbc.co.uk. 21 July 2013. Retrieved 8 August 2013. ^ Hebbert, Michael; Deas, Iain (January 2000). "Greater Manchester – 'up and going'?". Policy & Politics. 28 (1): 79–92. doi:10.1332/0305573002500848. ^ Chancellor of the Duchy of Lancaster. "Keeper of the Rolls". duchyoflancaster.co.uk. Archived from the original on 15 December 2010. Retrieved 2 March 2014. ^ "No. 58395". The London Gazette. 18 July 2007. p. 10329. ^ "Greater Manchester Met. C". visionofbritain.org.uk. Retrieved 6 April 2007. ^ "Lib Dems close in on Manchester". Manchester Evening News. 11 June 2004. Retrieved 26 February 2006. ^ "Labour party returns to Manchester". timeout.com. 2006. Archived from the original on 13 January 2008. Retrieved 2 March 2014. ^ "Greater Manchester Met. C: Total Population". visionofbritain.org.uk. Retrieved 24 September 2012. ^ Clark 1973, p. 93. 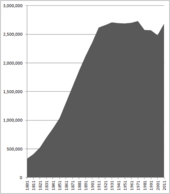 ^ "Regional Portrait of Greater Manchester – 5.3 Population Structure/Migration (demography)" (PDF). BISER Europe Regions Domain Reporting. 2003. Archived from the original (PDF) on 8 July 2011. Retrieved 18 February 2008. ^ "Warren Smith welcomes you to the Greater Manchester Lieutenancy". manchesterlieutenancy.org. Retrieved 8 July 2008. ^ "Exodus: The Facts". can.uk.com. 2003. Archived from the original on 4 February 2008. Retrieved 2 March 2014. ^ "Greater Manchester (health authority) religion". Statistics.gov.uk. Archived from the original on 11 January 2009. Retrieved 1 February 2008. ^ "Catholic Diocese of Shrewsbury". Dioceseofshrewsbury.org. Retrieved 7 May 2007. ^ "Parishes of the Diocese". Salforddiocese.org.uk. Archived from the original on 2 May 2007. Retrieved 7 May 2007. ^ "The Church of England Diocese of Manchester". manchester.anglican.org. Archived from the original on 27 December 2007. Retrieved 17 January 2008. ^ "Welcome to the Diocese of Liverpool". liverpool.anglican.org. Retrieved 1 February 2008. ^ "Market Renewal: Manchester Salford Pathfinder" (PDF). Audit Commission. 2003. Archived from the original (PDF) on 10 August 2008. Retrieved 2 March 2014. ^ a b c d e "Shrinking Cities: Manchester/Liverpool II" (PDF). shrinkingcities.com. March 2004. p. 36. Retrieved 4 March 2008. ^ Shapely, Peter (2002). "The press and the system built developments of inner-city Manchester" (PDF). Manchester Region History Review. Manchester Centre for Regional History. 16: 30–39. ISSN 0952-4320. Archived from the original (PDF) on 1 December 2007. Retrieved 2 March 2014. ^ Qureshi, Yakub (24 November 2004). "A cut above: high rise living is back". BBC. Retrieved 25 February 2008. ^ Cunningham, John (28 February 2001). "Tower blocks to make a comeback". The Guardian. Retrieved 26 February 2008. ^ Dyckhoff, Tom (9 December 2011). "Let's move to: Saddleworth, Greater Manchester". The Guardian. Retrieved 30 September 2012. ^ Kirby, Dean (24 August 2013). "Street where houses cost just £15,000 - we reveal cheapest and dearest homes in Greater Manchester". Manchester Evening News. Retrieved 24 August 2013. ^ a b Bontje, Musterd & Pelzer 2011, p. 159. ^ Frangopulo 1977, p. 224. ^ Tight, Malcolm (July 2007). "The (Re)Location of Higher Education in England (Revisited)". Higher Education Quarterly. 61 (3): 250–265. doi:10.1111/j.1468-2273.2007.00354.x. ^ Hartwell 2001, p. 105. ^ "Manchester College's "strong management"". manchestermule.com. 27 May 2010. Retrieved 29 June 2013. ^ a b c d "Manchester to revive Britain's textile trade with reborn Cottonopolis". Manchester Evening News. menmedia.co.uk. 3 November 2012. Archived from the original on 7 November 2012. Retrieved 4 November 2012. ^ "Oldham's Economic Profile – Innovation and Technology". Oldham Council. Archived from the original on 13 January 2007. Retrieved 2 March 2014. ^ "NW Cotton Towns Learning Journey". Spinning the web. Manchester City Council. Archived from the original on 10 September 2007. Retrieved 27 October 2006. ^ "The rise of the 'greatest village in England'". Manchester Evening News. menmedia.co.uk. 3 November 2012. Archived from the original on 6 November 2012. Retrieved 3 November 2012. ^ a b "Regional Portrait of Greater Manchester – 6 Economic Factors" (PDF). BISER Europe Regions Domain Reporting. 2003. Archived from the original (PDF) on 18 October 2006. Retrieved 2 March 2014. ^ "Our History". co-operative.coop. Retrieved 18 December 2014. ^ Roue, Lucy (27 November 2014). "200 staff to undergo consultation process at Co-operative's Manchester head office One Angel Square". manchestereveningnews.co.uk. Retrieved 18 December 2014. ^ Begum, Shelina (14 November 2013). "Co-op's headquarters declared greenest building in the world". manchestereveningnews.co.uk. Archived from the original on 20 March 2015. ^ "Manchester city region – Economic Overview". investinmanchester.com. Archived from the original on 21 March 2008. Retrieved 2 March 2014. ^ "Greater Manchester Economic Data". Midas Manchester. 2003. Archived from the original on 13 August 2007. Retrieved 10 July 2008. ^ "The Greater Manchester Strategy: Foreword". gmep.org.uk. 2004. Archived from the original on 22 April 2008. Retrieved 9 July 2008. ^ "Britain's Best Cities 2005–2006 Executive Summary" (PDF). OMIS Research. 2006. Archived from the original (PDF) on 17 May 2006. Retrieved 17 July 2008. ^ "Manchester – The State of the City". Manchester City Council. 2007. Retrieved 11 September 2007. ^ "International Visitors To Friendly Manchester Up 10%" (Press release). Marketing Manchester. 17 September 2007. Archived from the original on 27 October 2007. Retrieved 17 July 2008. ^ "Manchester 'England's second city'". BBC. 12 September 2002. Retrieved 5 January 2010. ^ "Greater Manchester (health authority) economic activity". statistics.gov.uk. Archived from the original on 11 January 2009. Retrieved 3 February 2008. ^ "Promoting a Dynamic Economy". Greater Manchester e-Government Partnership. Archived from the original on 12 January 2008. Retrieved 12 December 2007. ^ "Greater Manchester (health authority) industry of employment". statistics.gov.uk. Archived from the original on 11 January 2009. Retrieved 3 February 2008. ^ "Regional Gross Value Added (pp. 240–253)" (PDF). Office for National Statistics. 21 December 2005. Archived from the original (PDF) on 1 December 2007. Retrieved 2 March 2014. ^ a b Kirby, Dean (1 April 2011). "All Change: Greater Manchester Passenger Transport Executive becomes Transport for Greater Manchester – With a New Logo of Course". Manchester Evening News. menmedia.co.uk. Archived from the original on 4 April 2011. Retrieved 5 April 2011. ^ a b c d Frangopulo 1977, p. 187. ^ a b Hyde, O'Rourke & Portland 2004, p. 141. ^ "British Roads Database". cbrd.co.uk. Retrieved 6 March 2008. ^ Matthews 1992, p. 121. ^ Lancashire County Council. 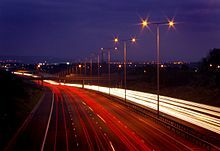 "Early Highways Liverpool-East Lancashire Road A580". Historic Highways. lancashire.gov.uk. Archived from the original on 22 February 2008. Retrieved 19 January 2008. ^ Salter, Alan (5 May 2007). "C-charge details revealed". Manchester Evening News. Archived from the original on 8 July 2008. Retrieved 25 November 2007. ^ "Manchester makes move towards congestion charge". The Guardian. 27 July 2007. Retrieved 31 March 2010. ^ "Traffic Congestion charging: FAQs". BBC Manchester. Retrieved 26 November 2007. ^ Britton, Paul (13 October 2014). "New Metrolink line to Wythenshawe and Manchester Airport to open on November 3 – a year ahead of schedule". manchestereveningnew.co.uk. Retrieved 18 December 2014. ^ Salford City Council (February 2012). "Salford Infrastructure Delivery Plan" (PDF). salford.gov.uk. Archived from the original (PDF) on 20 May 2013. Retrieved 22 January 2013. ^ "RATP buys Manchester Metrolink operator". Railway Gazette International. London. 2 August 2011. ^ GMPTE. "GMPTE – Trains". gmpte.com. Archived from the original on 15 December 2006. Retrieved 2 March 2014. ^ a b "State of the City Report 2006/2007" (PDF). manchester.gov.uk. September 2007. Archived from the original (PDF) on 4 January 2008. Retrieved 2 March 2014. ^ "Manchester Airport offers more destinations than Heathrow and Gatwick". UK Airport News. TMC Ltd. 3 June 2006. Archived from the original on 2 December 2008. Retrieved 10 July 2008. ^ a b c Gratton, Chris; Simon Shibli; Richard Coleman (2005). "Sport and Economic Regeneration in Cities". Urban Studies. Urban Studies Journal Limited. 42 (5–6): 985–999. doi:10.1080/00420980500107045. ^ Parkinson-Bailey 2000, pp. 249–250. ^ "City enjoys £600m windfall". BBC Online. 16 June 2006. Retrieved 5 January 2010. ^ Jupp, Adam (11 April 2013). "£300m: The staggering amount Manchester makes from football every year". Manchester Evening News. manchestereveningnews.co.uk. Retrieved 16 April 2013. ^ "What we do". Manchester FA. Retrieved 2 October 2012. ^ Salazar, Jo-Ryan. "The 100 Greatest Soccer Clubs in the World". Bleacher Report. Retrieved 13 October 2017. ^ "Soccer Team Valuations No. 1 Manchester United". Forbes. Forbes.com LLC. 30 April 2008. Retrieved 2 May 2008. ^ Ozanian, Mike. "The World's Most Valuable Soccer Teams 2017". Forbes. Retrieved 13 October 2017. ^ "Glory, Glory, Man United". The website of dreams. Retrieved 2 June 2008. ^ "Roll of honour". Manchester City FC. Archived from the original on 10 December 2007. Retrieved 2 March 2014. ^ "Brief history of Wigan Athletic". Wigan Athletic Football Club. 11 June 2007. Archived from the original on 6 January 2008. Retrieved 2 March 2014. ^ "Honours". wiganwarriors.com. Wigan Warriors. 2008. Archived from the original on 12 April 2008. Retrieved 3 May 2008. ^ "BBC Rugby Union – English – Sale 45-20 Leicester". BBC. 27 May 2006. Retrieved 5 January 2010. ^ "Champions At Last". LCCC.co.uk. Archived from the original on 4 November 2014. Retrieved 4 November 2014. ^ "Jim Laker". Cricinfo. Retrieved 2 May 2008. ^ "Minor County Grounds". Minor Counties Cricket Association. Cricinfo. Retrieved 2 May 2008. ^ Hughes, Stuart (5 November 2002). "D-day for Storm". BBC Online. Retrieved 5 January 2010. ^ Hughes, Stuart (12 November 2002). "Storm sink as cash bid fails". BBC Online. Retrieved 5 January 2010. ^ Salford Metropolitan Borough Council. "Transcript of Kersal Dale Video". Salford.gov.uk. Archived from the original on 27 May 2008. Retrieved 5 March 2008. ^ "Greater Manchester Athletics Association". greatermanchesteraa.co.uk. Archived from the original on 1 July 2011. Retrieved 4 May 2011. ^ Greater Manchester Marathon Ltd (2012). "General Information". greatermanchestermarathon.com. Archived from the original on 8 February 2013. Retrieved 28 April 2012. ^ "Leigh Sports Village". Leigh Sports Village. Archived from the original on 24 April 2008. Retrieved 2 May 2008. ^ "Aims and Objectives". amaechibasketballcentre.com. Archived from the original on 1 June 2011. Retrieved 4 May 2011. ^ "Manchester's basketball club prove they are magic as teams qualify for cup final". manchester.gov.uk. 6 March 2006. Retrieved 4 May 2011. ^ "Official Website of Greater Manchester County Crown Green Bowling Association". gmbowls.org.uk. 2 May 2011. Retrieved 5 May 2011. ^ "County team dodge a bullet". Oldham Evening Chronicle. oldham-chronicle.co.uk. 3 May 2011. Archived from the original on 3 March 2016. Retrieved 4 May 2011. ^ GreaterSport. "About GreaterSport: Greater Manchester Sports Partnership". greatersport.co.uk. Archived from the original on 22 November 2012. Retrieved 2 October 2012. ^ "Greater Manchester Sports Fund". manchestercommunitycentral.org. Retrieved 4 May 2011. ^ a b Robson, Brian (2004). "Culture and the City: A View from the 'Athens of the North'". Built Environment. 30 (3): 246–255. doi:10.2148/benv.30.3.246.54298. ^ a b c d Visit Manchester. "Greater Manchester local delicacies". visitmanchester.com. Retrieved 27 September 2012. ^ Taylor, Paul (9 September 2004). "How city's pride fell to big business". Manchester Evening News. menmedia.co.uk. Archived from the original on 7 July 2012. ^ "Rochdale 'boozer' The Baum crowned Britain's best pub". BBC News. bbc.co.uk. 13 February 2013. Retrieved 20 December 2014. ^ Slater, Chris (12 September 2013). "Rochdale pub aims to be named Britain's best for second year running at CAMRA awards". manchestereveningnews.co.uk. Retrieved 17 December 2014. ^ "Pub of the Year - Previous Winners". camra.org.uk. Retrieved 20 December 2014. ^ "Manchester Food and Drink Festival". visitmanchester.com. September 2014. Archived from the original on 18 December 2014. Retrieved 17 December 2014. ^ "Controversy At World Pie Eating Competition". huffingtonpost.co.uk. 18 December 2014. Retrieved 20 December 2014. ^ Bury Council. "Ramsbottom Annual Chocolate Festival". bury.gov.uk. Archived from the original on 20 December 2014. Retrieved 20 December 2014. ^ "Greater Manchester restaurants fail to win a single Michelin star in 2012 guide". manchestereveningnews.co.uk. 6 October 2011. Retrieved 17 December 2014. ^ "Greater Manchester Museums Group". gmmg.org.uk. Retrieved 9 April 2014. ^ "Past Exhibits at Gallery Oldham". galleryoldham.org.uk. Archived from the original on 3 July 2008. Retrieved 9 January 2008. ^ "Lark Hill Place Shops". Salford City Council. Archived from the original on 4 August 2007. Retrieved 2 May 2008. ^ "Caroline Birley". Bolton Museum. 7 June 2007. Archived from the original on 8 February 2012. Retrieved 23 January 2012. ^ "City Art Gallery". Images of England. Retrieved 14 December 2007. ^ "About Stockport Hat Works". hatworks.org.uk. Retrieved 10 January 2008. ^ "Museum of Science & Industry". The National Virtual Museum. 24hourmuseum.org.uk. Retrieved 10 January 2008. ^ "Urbis visitors increase by 550%". BBC Online. 12 April 2004. Retrieved 5 January 2010. • "Visitors flock to Urbis as revamp pays off". Manchester Evening News. 6 December 2006. Retrieved 10 January 2008. ^ "About Stockport air raid shelters". airraidshelters.org.uk. Retrieved 10 January 2008. ^ "Imperial War Museum North". north.iwm.org.uk. Retrieved 10 January 2008. ^ "Introduction to the Museum of Transport". gmts.co.uk. Archived from the original on 21 January 2008. Retrieved 10 January 2008. ^ "The Pankhurst Centre". The National Virtual Museum. 24 Hour Museum. Retrieved 8 July 2008. ^ Vallely, Paul (30 April 2004). "On the road again". The Independent. Archived from the original on 11 May 2008. Retrieved 17 January 2008. ^ "Wigan Pier Closing Down Message". Wigan Leisure and Culture Trust. Archived from the original on 1 February 2009. Retrieved 2 March 2014. ^ Qureshi, Yakub (12 September 2012). "New movie-makers to star in Greater Manchester film festival". Manchester Evening News. menmedia.co.uk. Retrieved 27 September 2012. ^ Greater Manchester Film Festival (2012). "About the Festival". gmff.co.uk. Archived from the original on 25 October 2012. Retrieved 27 September 2012. ^ Little 1995, p. 112. ^ Hemley, Matthew (24 September 2010). "Coronation Street breaks two world records". The Stage. thestage.co.uk. Retrieved 26 September 2010. ^ Dowling, Nicola (18 May 2004). "Channel M tunes into future". Manchester Evening News. menmedia.co.uk. Archived from the original on 12 November 2012. Retrieved 20 January 2011. ^ "Greater Manchester's Channel M cuts staff to four". BBC News. news.bbc.co.uk. 17 March 2010. Retrieved 20 January 2011. ^ "Government move to set up a new gm tv channel". Oldham Evening Chronicle. oldham-chronicle.co.uk. 20 January 2011. Archived from the original on 14 July 2014. Retrieved 20 January 2011. ^ a b "Manchester Evening News". themediabriefing.com. Archived from the original on 5 July 2011. Retrieved 2 March 2014. ^ "About". corporate.menmedia.co.uk. Retrieved 27 September 2012. ^ "Projects". corporate.menmedia.co.uk. Retrieved 27 September 2012. ^ a b Brooks-Pollock, Tom (30 November 2011). "Lowry gallery and theatre is most popular tourist attraction in Greater Manchester". Manchester Evening News. menmedia.co.uk. Archived from the original on 25 December 2011. Retrieved 1 December 2011. ^ Conway, Tony; Whitelock, Jeryl (2007). "Relationship marketing in the subsidised arts: the key to a strategic marketing focus". European Journal of Marketing. 41 (1/2): 199–222. doi:10.1108/03090560710718184. ISSN 0309-0566. ^ "About The Lowry". The Lowry. Archived from the original on 8 June 2008. Retrieved 2 May 2008. ^ a b c Schofield 2007. ^ Parkinson-Bailey 2000, p. 77. ^ a b "The Hallé – History". The Hallé Concerts Society. Archived from the original on 6 July 2010. Retrieved 2 March 2014. ^ "History of the BBC Philharmonic". BBC News. Archived from the original on 3 September 2007. Retrieved 2 May 2008. ^ "Launch of the BBC Connect And Create Partnership – speech given at Huddersfield University" (Press release). BBC. 11 January 2008. Retrieved 10 July 2008. ^ "Manchester Camerata". Manchester Camerata. Retrieved 2 May 2008. ^ "Bridgewater Hall facts and figures". bridgewater-hall.co.uk. Archived from the original on 7 October 2007. Retrieved 17 January 2008. • "Good Venue Guide; 28 – Bridgewater Hall, Manchester". Independent on Sunday. 12 April 1998. ^ Redhead 1993, pp. 60–61. ^ "Pollstar Concert Industry Awards Winners Archives". Pollstar Online. 2001. Archived from the original on 12 January 2013. Retrieved 24 June 2007. ^ "Manchester City stadium history". MCFC.co.uk. Archived from the original on 10 December 2007. Retrieved 11 January 2008. ^ "The Guardian view on Manchester's new cultural space: from one kind of factory to another". theguardian.com. 5 December 2014. Retrieved 17 December 2014. Aspin, Chris (1981). The Cotton Industry. Shire Publications. ISBN 0-85263-545-1. Bayliss, Don (1996). Historical Atlas of Trafford. Don Bayliss. ISBN 0-9529300-0-5. Bontje, Marco; Musterd, Sako; Pelzer, Peter (2011). Inventive City-Regions. Ashgate. ISBN 978-1-4094-1772-9. Bristow, M. Roger; Cross, Donald T. (1983). English Structure Planning: A Commentary on Procedure and Practice in the Seventies. Routledge. ISBN 0-85086-094-6. Carter, Charles Frederick (1962). Manchester and its Region. Manchester University Press. ISBN 978-0719000218. Clapson, Mark (2010). Ray Hutchison, ed. Suburbanization in Global Society. Emerald Group. ISBN 978-0-85724-347-8. Clark, David M. (1973). Greater Manchester Votes: A Guide to the New Metropolitan Authorities. Redrose. Cooper, Glynis (2005). Salford: An Illustrated History. The Breedon Books Publishing Company. ISBN 1-85983-455-8. Cowhig, W.T. (1976). It Happened Round Greater Manchester; Textiles. Greater Manchester Council. Dawson, Alan (1992). Relative hills of Britain. Cicerone Press. ISBN 1-85284-068-4. Frangopulo, Nicholas Joseph (1977). Tradition in action: the historical evolution of the Greater Manchester County. EP Publishing. ISBN 0-7158-1203-3. Freeman, Thomas Walter; Snodgrass, Catherine P. (1959). The Conurbations of Great Britain. Manchester University Press. ISBN 978-0719000546. Hardy, Peter B. (1998). Butterflies of Greater Manchester. PGL Enterprises. ISBN 0-9532374-0-0. Hartwell, Clare (2001). Pevsner Architectural Guides: Manchester. Penguin Books. ISBN 0-14-071131-7. Hartwell, Clare; Hyde, Matthew; Pevsner, Nikolaus (2004). Lancashire : Manchester and the South-East. The buildings of England. Yale University Press. ISBN 0-300-10583-5. Holland, Philip; Spence, Ian; Sutton, Trevor (1984). Breeding Birds in Greater Manchester. Manchester Ornithological Society. ISBN 978-0-9509505-0-1. Hyde, M.; O'Rourke, A.; Portland, P. (2004). Around the M60: Manchester's Orbital Motorway. AMCD. ISBN 1-897762-30-5. Kellie, Euan (2010). Rebuilding Manchester. Derby: Derby Books. ISBN 978-1-85983-786-3. Kidd, Alan (2006). Manchester: A History. Carnegie Publishing. ISBN 1-85936-128-5. Little, Daran (1995). The Coronation Street Story. Boxtree. ISBN 978-1-85283-464-7. Little, Daran (2000). 40 Years of Coronation Street. Andre Deutsch. ISBN 978-0-233-99806-0. Murray, Braham (2007). The worst it can be is a disaster. Methuen Drama, A & C Black Publishers. ISBN 978-0-7136-8490-2. Parkinson-Bailey, John J (2000). Manchester: an Architectural History. Manchester University Press. ISBN 0-7190-5606-3. Ramsden, Caroline (1966). Farewell Manchester: history of Manchester Racecourse. J A Allen & Co.
Ravetz, Joe (2000). City-Region 2020. Earthscan. ISBN 978-1-85383-606-0. Redcliffe-Maud, John; Wood, Bruce (1975). English local government reformed. OUP. ISBN 0-19-885091-3. Redcliffe-Maud, John (June 1969). Royal Commission on Local Government in England 1966–1969, Volume I: Report (Cmnd. 4040). HMSO. Redhead, Brian (1993). Manchester: a Celebration. Andre Deutsch Ltd. ISBN 0-233-98816-5. Rochdale Metropolitan Borough Council. Metropolitan Rochdale Official Guide. Ed. J. Burrow & Co. Limited. Schofield, Jonathan (2003). City Life: Manchester the Complete Guide. City Life. ISBN 978-0-9544460-0-0. Schofield, Jonathan (2007). Manchester: the complete guide 2007. City Life. Taylor, Ian; Evans, Karen; Fraser, Penny (1996). A Tale of Two Cities: Global Change, Local Feeling, and Everyday Life in the North of England: a Study in Manchester and Sheffield. Routledge. ISBN 978-0-415-13828-4. Wannop, Urlan (2002). Regional Imperative: Regional Planning and Governance in Britain, Europe and the United States. Routledge. ISBN 978-0-11-702368-0. Wilson, David; Game, Chris (2002). Local Government in the United Kingdom (3rd ed.). Palgrave MacMillan. ISBN 978-0-333-94859-0. Wikimedia Commons has media related to Greater Manchester. Wikivoyage has a travel guide for Greater Manchester.